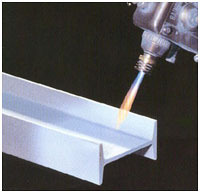 Spray-galvanizing is a version of flame spraying where a zinc wire is fused by an arc and pulverized by compressed-air before it is applied to the work piece. The zinc which is still liquid produces a porous layer on the work piece which is pre-treated by sandblasting. This layer has characteristics of corrosion protection which are just as good as these from a layer created by hot-dip galvanizing. Furthermore, the layer is very absorbent because of the high inner surface. As a consequence, extraordinary large plenty of base coat or filler are necessary for the following paintwork. Advantages of that procedure over compared to hot-dip galvanizing are that the thermal impact on the work piece is very small and that a deformation can also be excluded in connection with big areas.